Using file tags can help to arrange, organize, and prioritize documents, files, and data. 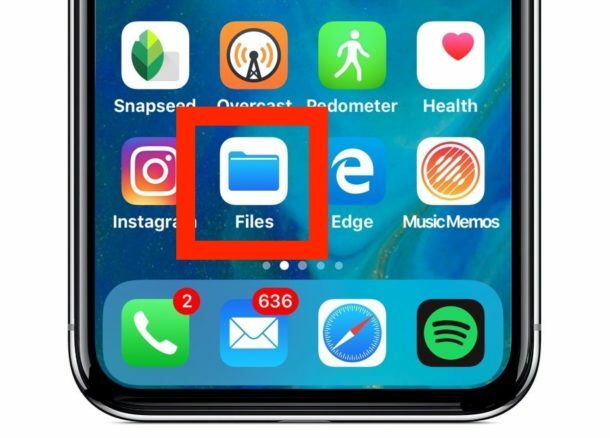 Now that iOS has a dedicated Files app for the iPhone and iPad, you might find it helpful to know that you can tag any items, files, documents, images, or anything else stored within the Files app of iOS, much like you can tag files in the Mac Finder. 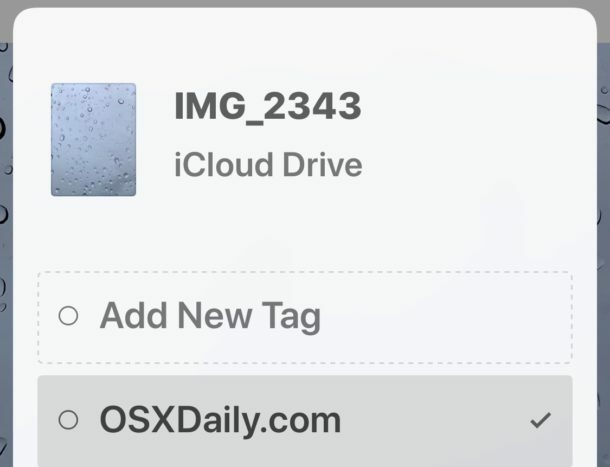 And perhaps best of all, if the tagged files are stored in iCloud Drive, they will sync to other iOS devices and Macs as well, with that same tag. Tagging files in iOS is a simple process, but it’s easily overlooked. This tutorial will show you how to tag a single file, how to tag multiple files, and how to view tagged files in the iOS Files app. The Files app is available on all iPhone and iPad devices running iOS 11 or later. The tutorial here is demonstrated on an iPhone but the behavior is the same on an iPad too. That’s it, your selected file will have been tagged with the tag of your choice. If you’re syncing data with iCloud, then the file tags will sync over to other devices shortly. And yes if you tag a file from iCloud Drive on the Mac, that tag will sync with the associated file to iPhone or iPad as well via Files app. Whether you tag one file or many files is up to you. Of course you can easily see the tagged files from the iOS Files app as well. This is also where the power of file tagging can be extra useful, because you can use file tags to quickly see and edit items you have tagged, without having to navigate to wherever their original location is in the Files app or file system. Note that on the iPad the Browse section will be in the Files app sidebar if the device is orientated horizontally. For Mac users reading this and wondering about tagging directly in the Finder of Mac OS, or from within iCloud Drive, you can tag files on the Mac with drag and drop, or with a file tag keyboard shortcut, and remove tags just as well too. While tagging is fairly new to the iOS world with Files app, the Tags feature has been around on the Mac for a very long time, where it used to be called “Labels” before rebranding as Tags in more recent Mac OS releases. Anyway, enjoy your tags! I like tags, but I am hoping the Files app will mature into a better file system for iOS. I’d like direct access to Photos from the Files app for example, making it available like any other folder. Tags are most practical on a desktop environment, agree with Jon that at the moment the Files app in iOS may be limited to really get full use from them. But it’s useful, and it’s heading in the right direction. Tagging would be much more useful for photos, which apparently is still impossible in iOS. The “tags” for most files are filenames themselves, while photos, though they have a ton of metadata, aren’t usefully organized because tracking down one or a range of photo types is very cumbersome once you have hundreds (or more) “favorites” or Apple’s stupid AI doesn’t recognize the bloody obvious. A search for “car” in Photos doesn’t show half the photos I have taken of cars. If I could tag each photo of a car that I later wanted to see, I would see 100% of the photos I tagged with “car”. Apple is either extremely lazy in this regard or their app was so sloppily made from the start that it’s too much work to fix now. 23,000 photos over the last few years and I can’t organize them well natively. I’m looking into a better tool than Apple’s pathetic offering which encourages taking a lot of photos that then become part of an amorphous blob on iCloud unless you share them immediately or have a great memory for dates and places of photos taken. Shop on Amazon.com and help support OSXDaily! - What’s the Mac Equivalent to F5 Refresh Key from Windows? All trademarks and copyrights on this website are property of their respective owners. © 2019 OS X Daily. All Rights Reserved. Reproduction without explicit permission is prohibited.